1. Vidyarambh is conducted before your kid goes to school and that is why if you are planning to send your kid to play school, it is important to initiate their education through Vidyarambh sansakara. It ensures channelization of knowledge and wisdom in life of child. Vidyarambh ensures proper initiation of intellectual competence in toddler’s life. Initiates learning proficiency in your children before attending their first school. Perfectly showers teaching, which provides empowerment to your kids by strengthening them through true knowledge. Vidyarambh helps in holistic growth of the child. Complete accuracy in arrangement of Vidyarambh Sanskaras that showers blessing of responsible gods and goddesses on the child quite aptly. 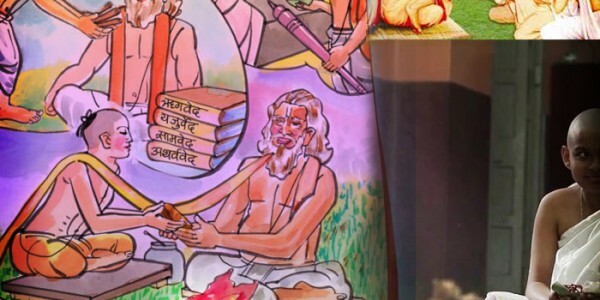 Puja Yagya incorporates Pundits who are fully expert in Vidyarambh Sanskaras and they are also trained pundits of Sanskrit Gurukul, where they get to know about all the Vedic rituals in the most authentic manner for serving mankind. For knowing details and impacts of Vidyarambha Sansakara, you may contact our Pundits and our Telephonic Consulting services are offered to you without any charge.